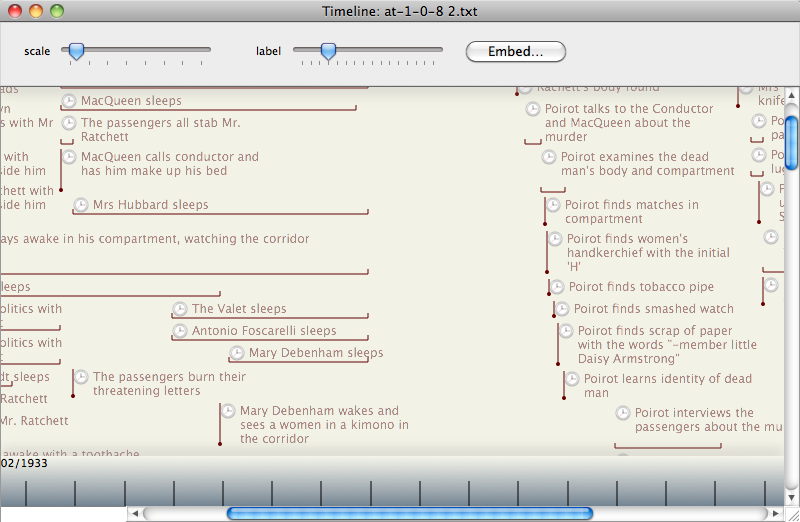 Aeon Timeline, a neat looking timeliner that seems to have emerged form the Scrivener community has at last left beta. Before some one posts asking if it can import TB data the answer is maybe. Basically AT's import filters are a bit fragile. It aims to support CSV or tab-delim but neither (yet) works properly, having spent some time trying today. Still, it's v1.0.0 so I'm sure that will be resolved. If you're tempted to try yourself, don't attempt tab-delim and in either format never include the standard line #1 with the target field names. I was going to post some export templates but i'll wait until AT import is more stable. I'll update this in due course. Now that Aeon Timeline seems to be at 1.0.7 or so, am wondering whether it imports better. #1. This is the data in BBEdit. Note all columns (field/attribute) values are quote enclosed. This is perfectly valid for the format but TB doesn't strip them. I've lodged a TB support request that it does as it's the only way TB can import tab delimited values with tabs or line breaks in them. ..noting that you'll need to do this for each attribute brought in. actually as the source attributes never change you could simply write one big action. Thanks for the illustration. So AT to TB does look workable already, unfortunately with a bit of fiddling. Is TB to AT better now, i.e. do AT's import filters behave more as expected? A relatively seamless TB<-->AT export/import both ways coupled with AT's sync with Scrivener would seem to open up very interesting possibilities. The curse of the unescapable quote strikes again! I tried the above as I've seen this replacement method work sometimes in action code but not consistently. ** Not quite so - see my next post in the thread. "Event Title"	"Start Date"	"End Date"	"Label"	"Arc"	"Participants"	"Tags"	"Notes"
"^value($Name)^"	"^value($StartDate.format("y-M0-D h:mm:s"))^"	"^value($EndDate.format("y-M0-D h:mm:s"))^"	"^value($Label)^"	"^value($Arc)^"	"^value($Participants.format(","))^"	"^value($Tags.format(","))^"	"^value($Text)^"
date format string originally had 'ss' for 's'. It didn't cause failure but was incorrect. My take on the process overall. from other sources and has no negative impact (that I can see). AT. Needs to fix the 'Participants' field import bug - see my next post in the thread. Mapping AT field names to TB attributes. Map AT dupes to TB aliases? AT exports UTF-16. TB reads UTF-8. Only things I can't work around as at AT v1.0.8 / TB v5.11.2 is AT's import bug (we lose one field only) and TB's problems doing things with double-quotes (I didn't even attempt quote-doubling on export). Still at present there's a fair deal of self-assembly (and TB skill) needed to 'just' import At -> TB. TB has the reverse well covered. Is it worth the vendors doing more to ease this? My hunch is that depends on the numbers of active users of both. These inter-app smoothings all take dev time/budget for other features. I'll update this if changes occur. With some fiddling (I removed quotes in the suggested 'AT data item' template so they wouldn't show up in AT, and exported $TimelineBand in the "Arc" column) the export from TB to AT went more smoothly than expected. In AT it turned out to be easy to manually rename the exported $TimelineBand numerical values to the corresponding members of $TimelineBandLabels. I suppose if one were exporting often and had lots of bands, the population of an $Arc attribute in TB could be automated quite easily. I didn't have the added complications of events in multiple TimelineBands (aliases), participants, etc. Can see, as things stand now, how going from AT back to TB could turn into a project in itself. Maybe that will become easier over time. Of course the number of active users of both applications is likely to be greater if the the applications play nicely with each other, just as (I assume) is the case with Scrivener. Chicken and egg sort of issue, I suppose. Format. AT is happy to consume TB's UTF-8 file with Classic Mac style line breaks (i.e. carriage return). Value formats: quoted values. Not sure the issue Sumner had, I find AT strips enclosing quotes just fine. Values containing double-quotes/tabs/line-breaks must be quote-enlcosed. He said "Hello" to me --> "He said ""Hello"" to me"
..though unfortunately TB struggles to do this during export (in in action code within export code). Helpfully, or not(! ), my test case has a note with straight double quotes in the title. Value formats: list values. Doesn't mind if last comma (such as it exports) is omitted from list. As long as there is a comma between each list value, that's OK.
Value formats: dates. No need to provide the era (e.g. 'AD') tag on the end. Format is 4 digit year/zero-padded month number/zero-padded day number/space/zero-padded 2 digit hours 01-24/colon/zero-padded 2 digit minutes/colon/zero-padded 2 digit seconds. The TB format string for that is "y-M0-D h:mm:s"
Tags. As with other lists, if correctly formatted these are added to note and to the AT files Settings->Tags pane. Participants ( = 'Entity' within AT). As for arcs - these must be set up first & and theres no way to bulk import a list of Participant values. Otherwise, participant data is blank. On the AT import pane, under "Create new if there are no existing matches", tick "Entity" and the Entity list will auto-populate with Participant values. AT Participant status (None/Participant/Observer/Birth/Death) is not exportable from AT nor can it be supplied to it via import. Participant colour is not catered for but that's only used in AT anyway and easily altered. Labels. As for arcs - these must be set up first & and theres no way to bulk import a list of Label values. On the AT import pane, under "Create new if there are no existing matches", tick "Label" and the Label list will auto-populate. Otherwise, all imported events are assigned the default Label. Note that AT helpfully remembers the last used state for the label/arc/entity tick boxes so if only going between TB and AT you'll only need to set these once. Plus, you'll have a good hunch of the cause if all events end up on the Global arc as these boxes got unpicked for some reason. AT colours. These aren't exportable or displayable as colour value. For the detail obsessive, I guess you can dig out your Mac's (Apps/Utilities/) Digital Color Meter so you can read the colour values from AT's UI and apply them in TB. Duplicate events. To a TB user's eye these may look effectively like aliases. They aren't. In AT, for an event to appear in more than one arc, the event must be duped. In doing so, the dupe becomes an event in its own right and can have discrete Arc/Label/Tag/Note info (which wouldn't be possible for an alias). So a round trip is possible, but really only as a proof of concept at this stage! However, if you set up your TB and AT with some pre-staging and have a decent text editing tool to hand (e.g. the free TextWrangler), repeat import/exports are less effort if not exactly painless. Should the two apps decide to have closer interchange, I've one other thought and that is to emit a separate data file for the doc level info: timeline's name. overall start/end dates, tag/label/participant lists,etc. This is less for totally automated import but so as to have a concise reference to configuring the 'other' app. Sure full integration would be swell, but practically this little step would make current interchange less painful. Thanks for the helpful additional details. AT has no way to bulk import/export Arc values. All imported Arc data is set to 'Global' unless the imported arc values are already added to the AT document. Arcs imported well for me "in bulk" into a blank AT document (with no pre-staging) after I noticed that in AT's 'Import Events' pane I could tick 'Arc' under 'Create new if there are no existing matches:' After import I found I didn't have to fiddle with individual events. All I had to do was go to the 'Manage Arcs' pane and rename each imported Arc name (I had six Arcs from six TB TimelineBands, with which I had associated several dozen events) from the numerical $TimelineBand value exported by TB to whatever I wanted in English. The events in AT immediately appeared in the appropriate (and now appropriately named) Arcs. Supposedly same for Labels and Entities, though I haven't tried those, or Participants. Or if you happen to have a copy of Excel on hand. I've found Excel lives up to its name when importing tab-delimited or comma-separated files for visual inspection, cleanup and reexport. Overall, taking a moderately complex timeline from TB into AT is already pretty easy, especially if an export template is provided for TB. If made a little easier, it would open up some interesting new possibilities for sophisticated analysis by writers and researchers using TB and Scrivener that other tools simply can't match. Ah, I completely missed those settings. Or rather, i tried them early on then forgot completely whilst checking other stuff. I'll correct my errors up thread. I can see now how your $TimelineBand -> (number) Arc will work nicely. FWIW, Participant == Entity. AT uses the latter term internally but exports/imports said data using the former term. I suspect the former got superseded by the latter during the design process but only the the UI labels changed, not the schema beneath. Agreed that Excel is a good tool. For anyone handy with AppleScript i suspect Numbers might suffice too. Thanks for the correction - now to go fix those errors up-thread. Ah, thanks for that pointer. I'd seen Entities in a quick look at AT videos but was wondering what a Participant was. Haven't had time to work with Entities in AT but assume they and relationship mode and the ability to display ages at the time of an event may be features currently without (easy) equivalents in a TB timeline.